Urinary tract infections, including uncomplicated cystitis, pyelonephritis, prostatitis, and perinephric abscess, are the most common type of clinical infections produced by enterococci (Box 1). Most enterococcal urinary tract infections are nosocomial and are associated with urinary catheterization or instrumentation. Nosocomial enterococcal bacteremias are commonly polymicrobial. Portals of entry for enterococcal bacteremia include the urinary tract, intra-abdominal or pelvic sources, wounds (especially burns, decubitus ulcers, and diabetic foot infections), intravascular catheters, and the biliary tree. Metastatic infections other than endocarditis are rare in enterococcal bacteremia. Enterococci account for ~5-10% of all cases of infective endocarditis (see site). Most cases are caused by E faecalis, but E faecium, E casseliflavus, E durans, E gallinarum, and E raffinosus have also been isolated from patients with endocarditis. Only ~2% of cases of enterococcal bacteremia are associated with endocarditis, and this is much more common in patients whose bacteremia is community acquired versus those with nosocomial enterococcal bacteremia. Enterococcal endocarditis is a disease of older patients, with males outnumbering females in most series. Most cases occur in patients with underlying valvular heart disease or prosthetic valves, although enterococci are capable of causing infections of anatomically normal valves. An association between enterococcal endocarditis and urinary tract infection or urinary instrumentation in older men and abortion or childbirth in younger women has been suggested. Enterococci usually produce left-sided endocarditis with more frequent involvement of the mitral than the aortic valve. The typical clinical course of enterococcal endocarditis is that of subacute bacterial endocarditis. There is a suggestion that the relapse rate is higher in patients who have had symptoms of endocarditis for = 3 months before treatment, which has implications for length of therapy (see below). Enterococci are frequently found as part of mixed aerobic and anaerobic flora in intra-abdominal and pelvic infections. As discussed above, the exact role of enterococci in these mixed aerobic and anaerobic intra-abdominal and pelvic infections is unclear. Enterococci can cause spontaneous peritonitis in patients with nephrotic syndrome or cirrhosis and can cause peritonitis in patients undergoing chronic ambulatory peritoneal dialysis. Monomicrobial enterococcal peritonitis is also occasionally seen as a complication of abdominal surgery or trauma. Enterococci can produce abscesses and bacteremia as a complication of endometritis, Cesarean section, and acute salpingitis. Enterococci may be isolated from mixed cultures with gram-negative bacilli and anaerobes in surgical wound infections, decubitus ulcers, and diabetic foot infections; the significance of enterococci in these settings is difficult to assess. Enterococcal wound colonization and sepsis have been described in burn patients whose wounds have been covered with porcine xenografts presumably contaminated with enterococci. Enterococci occasionally cause chronic osteomyelitis. Enterococci rarely cause meningitis. Most cases occur in patients who have anatomic defects of the central nervous system or who have had previous neurosurgery or head trauma. Rarely, however, meningitis may be a complication of high-grade bacteremia such as that seen in patients with enterococcal endocarditis. Meningitis may also be seen in association with enterococcal bacteremia in patients with human immunodeficiency virus infection and acute leukemia and in neonates and transplant recipients. Enterococci may cause neonatal sepsis characterized by fever, lethargy, and respiratory difficulty accompanied by bacteremia, meningitis, or both. Early onset bacteremia in otherwise normal neonates may be seen, as well as nosocomial bacteremia, meningitis, or both, which has been described in premature or low-birth-weight neonates who have nasogastric tubes and intravascular devices. 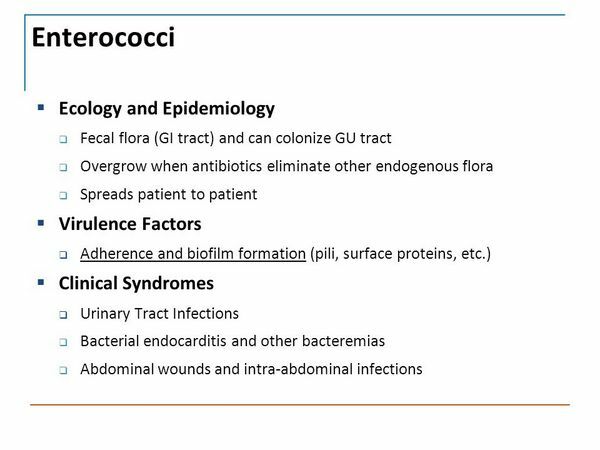 The diagnosis of enterococcal infection is made by isolating enterococci from typically sterile sites (eg, urine, blood, intra-abdominal or pelvic fluid, or spinal fluid). As discussed above, community acquisition of enterococcal bacteremia suggests the possible presence of endocarditis. The diagnosis of endocarditis, in the appropriate clinical context (see site), may be further confirmed by the presence of clinical findings consistent with endocarditis as well as by the use of echocardiography. The diagnosis of intra-abdominal and pelvic infections, in the appropriate clinical context, can be assisted by the use of ultrasound or computed tomographic imaging with drainage, Gram stain, and culture of any fluid collection(s) present. The diagnosis of enterococcal meningitis can be confirmed by the isolation of enterococci from the spinal fluid. Typically, enterococcal meningitis is associated with a low cerebrospinal fluid leukocyte count (< 200/mL), although this is not always the case. The isolation of enterococci from respiratory secretions is of questionable significance, although there are very rare well-documented cases of enterococcal pneumonia and even lung abscesses in patients with severe and debilitating diseases. Penicillin or ampicillin remains the antibiotic of choice for treating enterococcal infections such as urinary tract infections, peritonitis, and wound infections (ie, infections that do not require bactericidal treatment) (Box 2). Vancomycin is the alternative agent for patients allergic to penicillin or for organisms with high-level penicillin resistance that are ß-lactamase negative and vancomycin susceptible. Combination therapy with a cell wall-active agent such as penicillin, ampicillin, or vancomycin, along with an aminoglycoside, is essential for the treatment of enterococcal endocarditis and probably for enterococcal meningitis as well. The situation is not as clear-cut for enterococcal bacteremia alone; there is no consensus as to whether combination therapy is required in this setting. For the treatment of enterococcal endocarditis, combinations of cell wall-active agents such as penicillin, ampicillin, or vancomycin with aminoglycosides (usually streptomycin or gentamicin) are required (see site for specific treatment recommendations). In most cases, 4 weeks of combination therapy appear to be adequate, with a 6-week regimen reserved for patients who have had symptoms for > 3 months before starting treatment, for patients with prosthetic valves, or for patients who have relapsed after previous shorter courses of therapy. Most strains of enterococci are susceptible to nitrofurantoin, and this agent has been successfully used to treat uncomplicated enterococcal infections limited to the urinary tract. The quinolones such as ciprofloxacin, ofloxacin, levofloxacin, gatifloxacin, enoxacin, and norfloxacin have in vitro activity against enterococci and may be useful for treating some enterococcal urinary tract infections, but their effectiveness for enterococcal infections in general has not been convincingly demonstrated, and increasing resistance has been demonstrated. Tetracyclines and chloramphenicol may exhibit in vitro activity against some strains of enterococci, but they are only bacteriostatic against enterococci, and clinical failures of chloramphenicol and tetracyclines have been reported. The emergence of multiply resistant enterococci now greatly complicates therapeutic choices. For patients who have endocarditis caused by enterococci with high-level gentamicin resistance, it is useful to test for high-level streptomycin resistance because some highly gentamicin-resistant strains are synergistically killed by cell wall-active agents plus streptomycin. For endocarditis due to strains with both high-level streptomycin and gentamicin resistance, no combination will consistently produce synergism. These patients may be treated with prolonged courses (8-12 weeks) of intravenous ampicillin given by continuous infusion, although this approach should be considered experimental at this time. Surgical excision of infected valves may be required in such cases. Infections caused by enterococci with high-level penicillin resistance and ß-lactamase negativity should be treated with vancomycin. ß-lactamase- producing, penicillin- and ampicillin-resistant enterococci remain susceptible to ß-lactam-ß-lactamase inhibitor combinations such as ampicillin-sulbactam and amoxicillin-clavulanate. VRE that remain susceptible to penicillin or ampicillin may be treated with penicillin or ampicillin. Infections caused by organisms with both high-level penicillin resistance and vancomycin resistance should be treated with either quinupristin-dalfopristin or linezolid. Notably, E faecium is more susceptible to quinupristin-dalfopristin than is E faecalis. Neither quinupristin-dalfopristin nor linezolid have bactericidal activity against VRE resulting in enormous challenges in the management of VRE endocarditis. Prophylaxis for Infective Endocarditis. Antimicrobial prophylaxis for enterococcal endocarditis is recommended for patients with certain cardiac lesions predisposing to endocarditis who undergo invasive procedures with an increased risk of enterococcal bacteremia. Details of patients, procedures, and regimens are outlined in site. Prevention of Vancomycin Resistance. From 1989 to 1993, the percentage of nosocomial enterococcal infections reported to the Centers for Disease Control and Prevention's National Nosocomial Infection Surveillance System that were caused by VRE increased from 0.3 to 7.9%. This overall increase primarily reflected the 34-fold increase in the percentage of VRE infections in patients in intensive care units (ie, from 0.4 to 13.6%), although a trend toward an increased percentage of VRE infections in non-intensive care patients was also noted. Laboratory experiments have achieved the transfer of high-level vancomycin resistance from enterococci to Staphylococcus aureus, and reduced susceptibility of S aureus to vancomycin has recently been described in clinical S aureus isolates, although the mechanism of the latter resistance differs from that in enterococci. Vancomycin resistance has also been transferred by conjugation or transformation from enterococci to Streptococcus sanguis, Lactococcus lactis, Streptococcus pyogenes, and Listeria monocytogenes. The vanA gene has been found in vancomycin-resistant clinical isolates of Oerskovia turbata and Arcanobacterium haemolyticum (typically these organisms are vancomycin susceptible) isolated from the stools of two patients during an outbreak of VRE infection in London. The vanA gene has been identified in a Bacillus circulans clinical isolate. The vanB gene has recently been found in a vancomycin-resistant isolate of Streptococcus bovis isolated from a stool swab collected from a patient on admission as surveillance for VRE. The potential for emergence of vancomycin resistance in clinical isolates of Staphylococcus epidermidis, Streptococcus pneumoniae, viridans streptococci, and Corynebacterium spp. as a result of transfer of vancomycin resistance genes from enterococci is also a public health concern. In addition, education programs concerning the epidemiology of VRE and the potential impact of this pathogen on the cost and outcome of patient care were recommended for hospital staff including attending and consulting physicians; medical residents and students; pharmacy, nursing, and laboratory personnel; and other direct patient care providers. Specific recommendations were also issued for the microbiology laboratory regarding the detection, reporting, and control of VRE. In addition, recommendations were given regarding how to proceed when VRE are isolated from a clinical specimen, how to screen for detection of VRE, and how to prevent transmission of VRE once identified (Box 49-3). Recommendations for screening for roommates found to be infected or colonized with VRE were also issued.